Cleanliness Is Next to —————. The summer after my junior year in college, I went to Paris to research what I thought was going to be my senior thesis topic: the art of the French Revolution. It was late June 1991, 20 years ago almost to the day. I had gotten caught up in the whole beheading thing, and in one painting in particular — The Death of Marat. 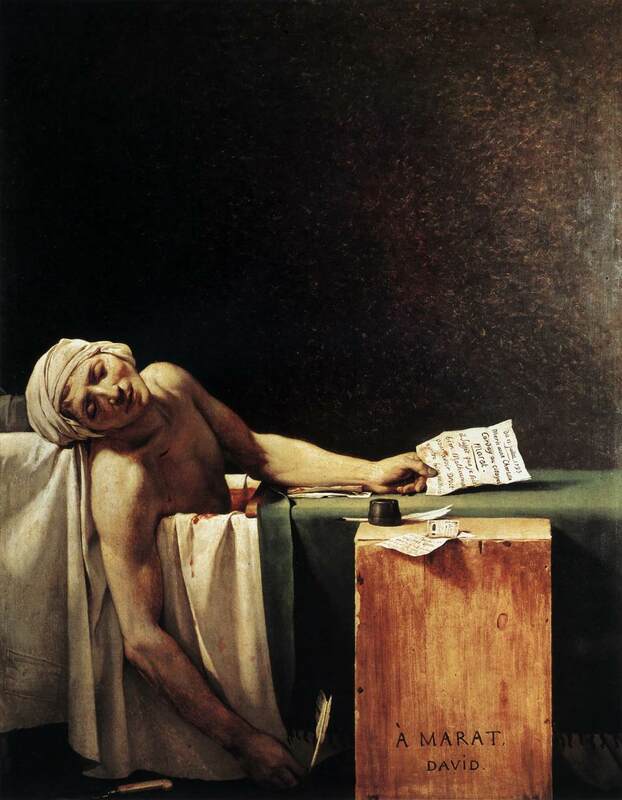 It memorializes the Jacobin hero Jean-Paul Marat, lying in a pool of his own blood following his murder in 1793. Marat had a skin condition that caused bouts of violent itching and required cold baths. He was taking a bath when his asssassin entered his room, pulled a knife and stabbed him clean through the heart. I had my fellowship money, my department-approved proposal, my ridiculous Paris apartment that no 20-year-old should have. Then one day, while researching hygiene rituals from the period in a library, I stumbled onto something. It was another image of a figure bathing. At first, I didn’t know how to process what I was seeing; it didn’t look quite like anything I’d seen before. But after a couple more hours of digging, I called my adviser to tell him I wasn’t going to be writing about the French Revolution. Here was an ad for laundry bleach (one of hundreds I would later find) whose premise rested on the idea that it could tackle the most stubborn dirt imaginable: the skin of a black person. What do ads for 19th-century detergent have to do with raising biracial kids in a small town in 2011? I’m not really sure, but I found myself pulling out my thesis two decades later, realizing how much this picture speaks to ideas about whiteness and blackness, especially in a child’s mind. Being dark(er) in a light world means getting the idea early on that your darkness is a ‘thing’ — not just that it’s less good, which our kids will inevitably be made to feel at some point, but that’s it’s some kind of layer, something that demands some kind of explanation. Something that, in this country and in this environment especially, people will react to continually, one way or another. A few months ago, my oldest said to his dad, “Daddy, I wish I was white.” When Brian asked why, Sky’s answer was pretty straightforward: “Because everything would be easier.” Indeed. I remember feeling that way as a little girl myself. I remember thinking: What if, somehow, I could wash it off? Wouldn’t that make me just the luckiest dark girl in this white world? This entry was written by caramels on maple street, posted on – Jun 30 at , filed under colorstruck. Bookmark the permalink. Follow any comments here with the RSS feed for this post. Post a comment or leave a trackback: Trackback URL. My youngest, who is just 4, often asks me when his skin is going to “change to lighter.” It breaks my heart. He is exactly the same gorgeous shade as his daddy, but knows that he was born with very light-colored skin (as many mixed-race children are), and all of his older siblings are more caramel than cocoa (as am I). And he wants to know when he’ll “match.” I’m half Haitian, and on my father’s side of the family the skin tones range from barely tan to deep brown, but it’s tough to explain genetics to a 4-year-old. I read stories like yours and I want to apologize for the entire human race. I found your blog through the Boston Globe article on Fenway Park. It is good to read such precise, emotion-infused, thought-provoking writing; speaking out for yourself and your family is both necessary and brave and though you shouldn’t have to explain, I’m glad you did. i am a journalist based outside Boston. my essays, op-ed pieces and narrative features appear in print and online publications. you can find my published work at franciewrites.com. my new blog for Boston.com, The Hyphenated Life, explores issues of race and cultural identity in the news. this month i wrote about kindergarten readiness, high-achievement parenting and combating the racial achievement gap for Essence magazine.